In the very early 70's, I would paddle my canoe down Black Creek Canal in South Miami to catch large mouth bass, snook and tarpon with the fly rod that my grandfather, Tuckie, gave me. Little did I know, what was down the road 35 years later. Skipping all the in between details, I started guiding, professionally, in Everglades National Park in the mid 90's. Previously, I had used fishing trips to the Park as a means of "entertainment" for my engineering clientele. This was a very successful marketing strategy as anyone could take them golfing or to a dinner, but few offered them an experience such as the Park provides. Many of these clients did what they could to push business my way. They all want to come back. A "lifestyle choice" led to my "escape" from engineering into the world of the fishing guide. When I told him of my plan, a very good friend of mine, "Big Jim Slade", said to me, "A fishing guide? You are going to be like every other guide I know. You'll have a rusted out pickup truck and a drinking problem". Jim was right about most guides, but luckily, not me. (My truck is beginning to show its age a bit, I guess.) www.ChokoloskeeCharters.com has developed into one of the most reputable and well respected traditional fishing operations in the area. With a network of some of the most experienced full time, professional guides here, we offer the most complete fishing experiences in the area. You can take a technical poling skiff into the extreme shallows to sight fish for laid up snook and redfish one day, a flats boat into the back country plug casting for tarpon the next and then fish offshore structure in a large center console digging up fish that feel like you are hooked to a Volkswagen. We offer lodging in town, camping trips on the islands and even specialty trips for families . . . And most recently, kayak fishing trips. This came about very simply. I was talking with a friend who saw something about it on the internet. He thought it was a neat idea. That very morning, my anglers and I had watched big snook wrecking havoc on baits in water that we just could not get to. Just as soon as Jim, told me about this idea about kayak fishing, I remembered my canoe, those snook, my frustration earlier in the day and the little light bulb in my head went off. The rest is history. Today, Everglades Kayak Fishing is one of the most recognized outfitters in the industry. With four full time guides and several other associate guides, we are able to offer expertise and experience to our client anglers that can not be found anywhere else. We operate two dedicated kayak transport boats, the Yak Attacks (a.k.a, the Mother Ships), that deliver up to six anglers, six outfitted kayaks, gear and an experienced captain/guide to remote parts of Everglades National Park. With a fleet of specially outfitted kayaks loaded on three separate trailers, we fish both the fresh and saltwater in Everglades National Park, Big Cypress National Preserve, the 10,000 Islands Preserve and Fakahatchee State Preserve. 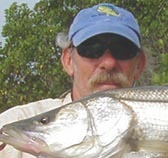 You can fish for snook, tarpon, redfish, speckled trout, flounder, jacks, etc. in the saltwater one day and large mouth bass, pan fish, exotic cichlids and Oscars the next. You can enjoy a multiday kayak fishing/camping trip on a pristine, remote Florida beach or stay in a luxury house on one of our special destinations trips to the Florida Keys to target bonefish. As we say, "Catch the Experience"
Capt. 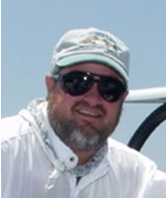 Charles Wright is a professional fishing guide, outdoor writer and naturalist. With four different boats and a fleet of outfitted fishing kayaks, anglers are able to experience all the fishing opportunities that the Everglades National Park and the 10,000 Islands have to offer. He grew up in South Florida and the Keys and has fished the Park since 1972. Schooled as an environmental engineer, an FAA Certified Flight Instructor and US Coast Guard Captain, he left the consulting business and moved to Everglades City after hurricane Andrew. Using a small private plane, he regularly scouts the area for new fishing grounds and offers a unique "on top" perspective to area. Charles regularly fishes the Florida Keys, Tampa Bay, Miami and the Bahamas, but he maintains fishing the Everglades City and Chokoloskee area is the best this State has to offer. Jon Shein has been an avid fisherman since age of five and has literally fished all over North America. Jon was a guide in a previous life (three year is Baja, Mexico) and will be joining the guide team of Everglades Kayak Fishing for the fall and winter fishing seasons. The rest of the year Jon will be kayak fishing somewhere … As we say in the summertime. 'Where's Jon". Jon presently writes for the New Jersey Angler and the Kayak Fishing Magazine. 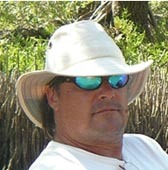 Jon was also the founder one of the kayak fishing industry's most influential websites, KayakFishingStuff.com. This website did much to shape the industry as we see it today. 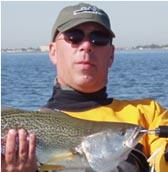 Jon experience in the industry adds much to Everglades Kayak Fishing. Capt. Bruce Hitchcock has been fishing the Everglades National Park for over 25 years. A Florida native, Bruce has been fishing the fresh and salt waters of South Florida with his father since he was a child. As an Everglades National Park Guide, US Coast Guard Captain and professional wildlife photographer, if Bruce is not fishing he is out exploring the remote backcountry of the Park on his own. With a dire passion for the Park, the Big Cypress National Preserve and Fakahatchee Strand, Bruce is a true ambassador for the area. Weather poling a flats skiff or guiding kayak anglers on the Yak Attack, anglers can learn much from his wealth of local experience. Rich Jones has been fishing Florida's waters for about ten years and has concentrated solely on kayak fishing for the last four. Rich has fished most all of his life in waters from California to Vermont. As a kayak fishing guide, Rich really enjoys first time kayak anglers. Guiding novice kayak anglers on their first kayak fishing trip in the Everglades, Rich gets to share their excitement again and again. 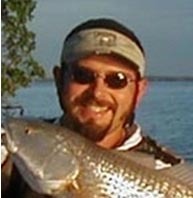 He enjoys educating his anglers and "showing them the ropes of kayaking fishing" Rich practices, light tackle, catch and release with artificial baits targeting primarily snook, redfish and speckled trout. "Kayak fishing the Everglades area is like no other fishing in the country. The rewards are not only the hunt and catching of game fish, but the solitude, scenery and wildlife that abounds the area." Jason Sine grew up in the Appalachian Mountain ranges of North Central West Virginia. There he started fishing early ut of a canoe, targeting large mouth bass in the summer. The winter season was left open for deer hunting and wading freezing streams for rainbow and golden trout. Later, Jason fished in the Midwest, mainly Kansas, Oklahoma and Arkansas for small mouth bass, crappie, catfish and striped bass using canoes or other paddle craft. After moving to Florida, Jason started kayak fishing and believes that fishing the mangroves and islands of Southwest Florida to be the best kayak fishing in the country. He spends most of his time on the water chasing redfish but loves a big snook day also. "With a fishery this diverse and a million of acres protected waters to explore; the opportunity for an exceptional experience is through any mangrove tunnel."